Pre-order launch is October 20th - October 27th. Please allow 2-3 weeks for shipping. Cupid's Bow is a deep oxblood jelly with multichrome red and purple shimmer and holo flakes. Autumn Serenity is a burnt orange linear holo with bronze and teal flakies. Golden Sunsets is a vibrant yellow based cremely with scattered gold and multi colored shimmers. The Marching Titans is a deep green jelly base with red to gold flake green shimmer and copper red to green UP pigment shimmer. Manna's Mighty Masterpiece is a bright azure scattered holo with green-to-blue flakies and purple shimmer. 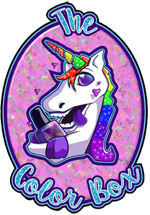 End of the Rainbow is a royal purple with a pink to purple/blue shift, purple metallic flakies, and sparse silver holo microglitters.